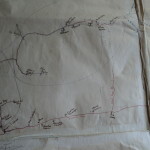 The MAP OF COMMUNITY RESIDENTS 1934 – 1942 was a large map drawn to accompany a survey of communities in the area of Pine Mountain Settlement School’s medical settlements. 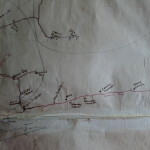 The survey took place during the years 1934 through 1942. Each family name was written by hand on a separate 6″ by 7 1/2″ notecard. 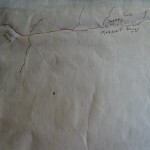 Notations and updates in different handwriting were done in later years. Birdena Bishop had assisted in a study of the local community in 1942. 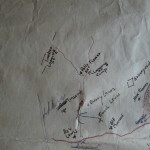 She most likely prepared the map, which showed where each family lived along the various creeks. 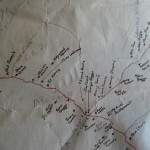 The following images represent various sections of the map. 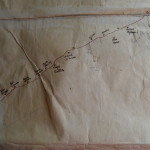 Hand-drawn on paper and attached to oilcloth, the map is in poor condition and may be difficult to read in some sections. 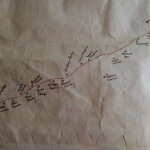 The map only reflects the families located in the area during the specific year that it was prepared and may not reflect families who may have departed the region before 1942. Links to Google satellite images and a table of community residents are provided for reference. This table is coordinated with the MAP OF COMMUNITY RESIDENTS 1934 – 1942. This list of persons living in the area of Pine Mountain Settlement School's medical settlements was taken during the years 1934 through 1942. Each family was recorded by hand on a separate 6" by 7 1/2" notecard. Notations and updates in different handwriting were done in later years. 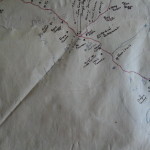 Accompanying the cards was a hand drawn map on oilcloth of the same area showing where each family lived along the various creeks. Mrs. - No Log - woodsman 9 - one attended PMSS for 3 months; 2 live elsewhere Big Laurel Big Laurel Moved Penn. 025 Mr. and Mrs. Browning Wilmer Divide Mr. - Yes, 3 yrs. 031 Mr. and Mrs. Creech Kermit Divide Mr. - Yes, 1 1/2 yrs. 014 Mr. and Mrs. Nolan Delbert Divide Mr. - Yes, 11 yrs. 018 Mr. and Mrs. Nolan Otto Divide Mr. - Yes, 8 yrs. 024 Mr. and Mrs. Turner Arthur Divide Mr. - Yes, 1/2 yr.
008 Mr. and Mrs. Wilder John Isaacs Run Mr. - Yes (grades & 1 yr. H.S. Ella Little Laurel Mr. - Yes, 6 mos.